Learning in the outdoors has significant educational advantages for children in the Primary School years and the need to connect with nature is becoming increasingly prominent in research worldwide. 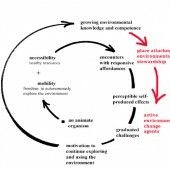 Pro-environmental behaviour, especially in the early years, has been shown to have a causal relationship with connectivity with the natural environment. Place-based outdoor learning promotes a relationship with the natural environment and constructs deep environmental knowledge and understanding of the world that surrounds learners. Embedding Indigenous culture and knowledge into outdoor learning within Primary School programs enables local knowledge and understanding to permeate throughout activities in explicit and experiential ways. A place-based pedagogy recognises the importance of forming intimate relationships with place through regular visitations to the same outdoor environment. One of the many global challenges confronting teachers working in Primary schools is how to implement holistic learning into their educational programs. This paper explores how an Australian case study utilises place-based outdoor learning and environmental sustainability within the school curriculum.